This post is all about something I don’t do that well. Asking for help. Many long time readers know that my wife is recovering successfully from oral cancer and that I worked on the original Microlite74 as way to cope during her recovery from 6 weeks of radiation treatment last year. What I’ve never talked about is the cost. We are some of the 40 to 50 million people in the US who do not have health insurance and do not qualify for government aid as we live in Texas and have no children. The cancer treatments have cost over $110,000 so far. While some of this has been absorbed by hospital foundations and the like, we still owe a lot of it. I haven’t talked about this before because we’ve been coping — barely. Unfortunately, I work on commission and I was told yesterday that over $800 in commissions payments due me this week will be delayed a month (or more). As we no longer have any savings, this leaves me unable to pay for utilities and food at the end of this month — I’m almost four hundred dollars short after delaying all the bills and expenses I can. I know I’m not doing this well, but if you can afford to donate toward our expenses, I’d be very grateful. 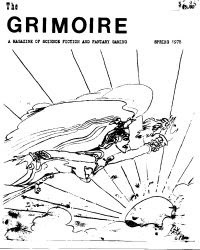 If you donate anything at all, you’ll get pdf copies of the two issues of The Grimoire I published in the late 1970s (which I blogged about here: The Grimoire #1 and The Grimoire #2) and a pdf copy of The Second Grimoire of Pharesm the Bright-Eyed, a set of house rules for a BECMI campaign I ran at a game shop in the mid-1980s. A number of people have asked if it was possible to get copies of The Grimoire issues, so this is a way to get copies of gaming material few people have ever seen and help a fellow gamer at the same time. It’s not much, I know, but its really all I have to offer. The person who donates the most (by the end of May 2009) will also receive a one-of-kind special edition digest-sized printed copy of Microlite75 2.0. This edition will have special artwork — mainly characters from my campaigns that I’ve had artists draw over the years. Only one copy will be printed. 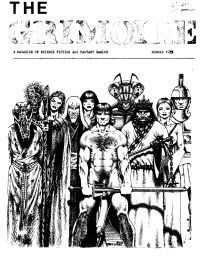 To get pdf copies of The Grimoire #1 and #2 and the BECMI campaign house rules, send a donation in any amount — small or large — to me via Paypal. My apologies for having to ask for donations and my heartfelt thanks to everyone who donates. If you cannot donate but wish to help, please spread the word about my request and offer. Thank you very much in advance. That can’t have been that easy. I didn’t know, actually, the genesis of Microlite74. It wasn’t easy, (and paying off the huge bills isn’t easy either) but the fact that my wife has been cancer-free for a year now after end of treatment makes it really worth it. This is especially true as her type of cancer is one of the rarer types where if it does not come back relatively quickly, it is far less likely to ever come back, dropping down to less than 1% chance after five years. I just wish my job provided more stable income. Commissions are great even in this bad ecomony but when a particular sale’s commission will end up in my pay seems more or less random chance. There is a logical system behind it (having to do with when and how a sale is actually paid), but the end result still looks like random chance from my end.